Cinema 4D light dome update. I’ve made a small update to the C4D light dome preset and thought I’d share it with you all. The Cloner no longer uses the Target Effector, the lights are simply rotated to point to the centre of the Light Dome Sphere. Simpler solution, therefore less to calculate, although you shouldn’t notice any difference at all here. Visible In Editor now makes the Light Dome Sphere visible too. This is handy for rotating the texture tag around so you can see how the light colour will be distributed. You can now use images to colour your lights (preferably HDRI). Also the texture is mapped correctly depending on the image or gradient used. Previously the gradient was mapped using spherical, now it uses flat mapping and as you adjust the size of the Light Dome Radius, the texture tag co-ordinates will update. For images, spherical mapping is used. Under the light settings are two new parameters. This lets you choose between using a gradient or using an image. 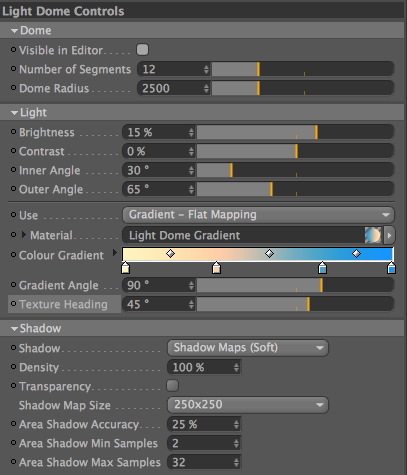 The appropriate mapping is used in the texture tag when you switch between the parameters. This is a link field and you need to drag the appropriate material into this field. If you create your own materials to use here, the Shader Effector references the Luminance channel, so be sure to place your image in the luminance channel. Alternatively, just replace the HDRI in the material I have provided. The HDRI I have included is based on three exposures, so you will probably get a more dynamic range if you use an alternative. Please remember that it is NOT ok to redistribute this or direct link to the download. If you would like to share this, then please simply link to the helloluxx blog and allow people to download from here. Thanks for your support, I hope you enjoy this minor update. The original tutorial for using Light Dome can be viewed here (this doesn’t cover the two new parameters). Light Dome requires Cinema4D r11 or later and the MoGraph module. I like to use your “Dome-Setup” quite often! great update – Thanks for sharing Tim! I don’t know if its possible for you to create tutorials about integration between c4d and RealFlow But Motion Graphic wise. unknown file format on 11.5, probably you have saved the file on the latest version. I’d like to ask something about Render setting. If I’ve rightly understand, we can use Dome light to “fake” (to avoid) GI but which render have we to use? Standard or Physical…? And what about animations (not still image render)? You can use both renders for animation. There wont be any GI noise since you are not using GI 😉 And its very very fast.